Orange isn't the only color carrots come in. My mother read the "Little House" books, by Laura Ingalls Wilder, to my siblings and I when we were young. Naturally, we loved them. We sewed quilts for our dolls. We tried to teach our calves to pull sleds, like Almanzo. We tried making butter. While trying this exercise (which was successful), we grated an orange carrot, just like Ma, and used it to color very white goat butter. As an adult, I read the books to my husband, and while contemplating the butter making part in Little House in the Big Woods, I wondered, "What other color of carrots are there, besides orange? Why did Laura specify an orange carrot?" Having always kept a garden, and having always been enamored by strange and colorful plants, it was a natural quest. 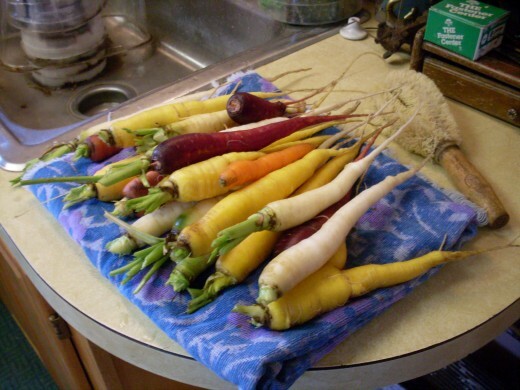 It seems that ancient carrots, from the Middle East, came in primarily purple or yellow, and that orange carrots are a rather new invention. The enterprising Dutch developed them in the 16th and 17th centuries. As soon as I found out I could grow something besides orange, I started right in, and have been tinkering with them for a few seasons. 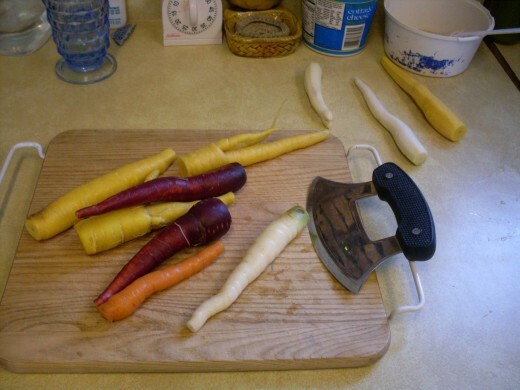 Unlike typical orange carrots, rainbow carrots tend to go woody fast. So watch them carefully in the garden, and dig them as soon as they seem big enough. 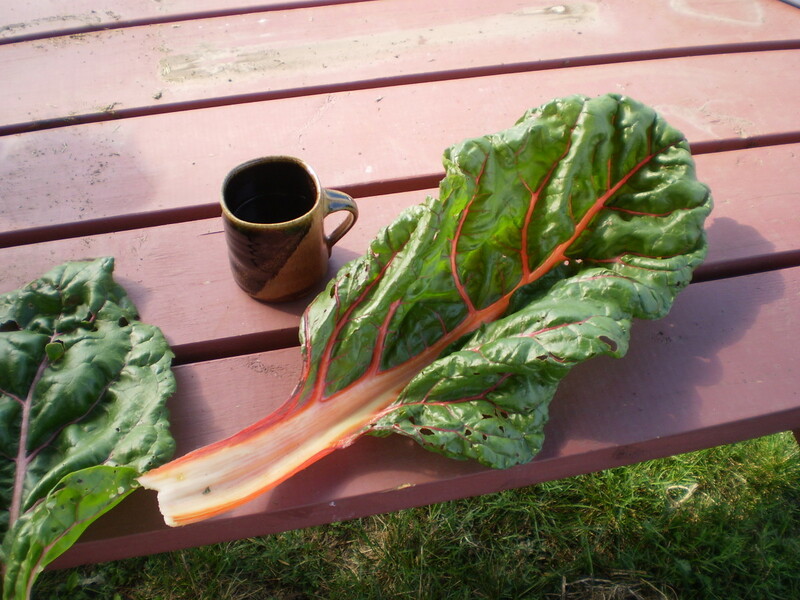 Of course, like all root crops, they prefer lose, sandy soil in which to expand and mature. But once they are mature, get them out of the heat! They do not seem to be able to overwinter well, and don't store as nicely in cellar conditions as do hardy orange carrots. Begin with carefully selected, well-scrubbed carrots. Chop off the ends, peel, and slice. 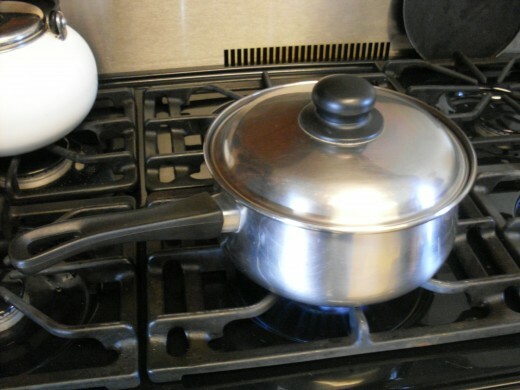 Have a pot of water on to boil. Put the carrot slices in boiling water for three minutes. This was the first batch, and all I had ready when the water boiled; you can put in more than this. 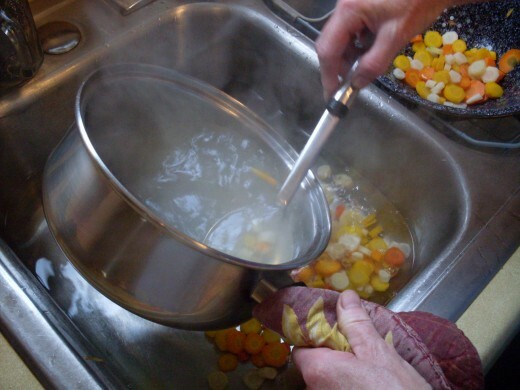 Scoop the carrots into very cold water, to "shock" them and stop the coooking. The water will grow cloudy afteer a bit. Don't worry about it. 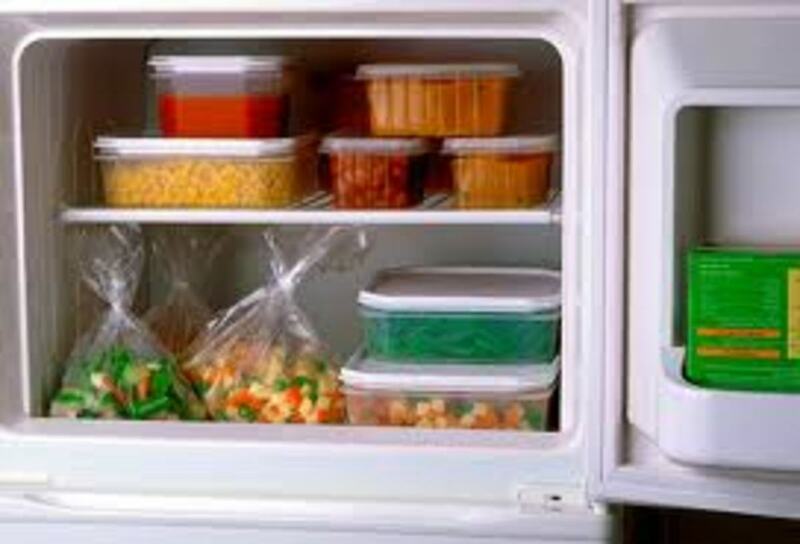 The best method for keeping your carrots is to freeze them. Of course, a few will keep nicely for some while in your refrigerator crisper, but rainbow carrots are so good, you'll want to plan for enough to use all year. Canning tends to make carrots mushy, and they lose some of their savor. So freezing is the answer. 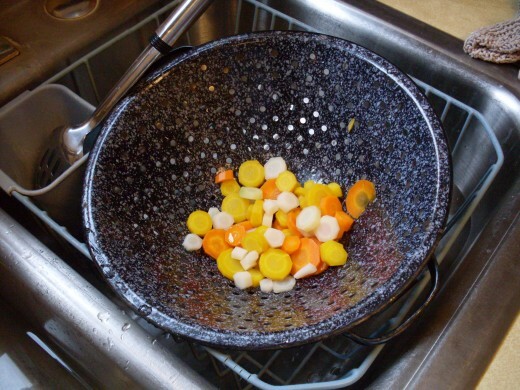 Begin by scrubbing the carrots gently, but thoroughly, under running water with a vegetable brush. Then chop off the root ends and the tops. Peel if desired (some of the colors will lose some of their vibrancy, as the skins are the brightest), then cut in slices. Next, you'll want to blanch the carrots. Proceed this way: Have a saucepan of water heating, and run a sinkful of plain, cold water. Be sure your sink is very clean! 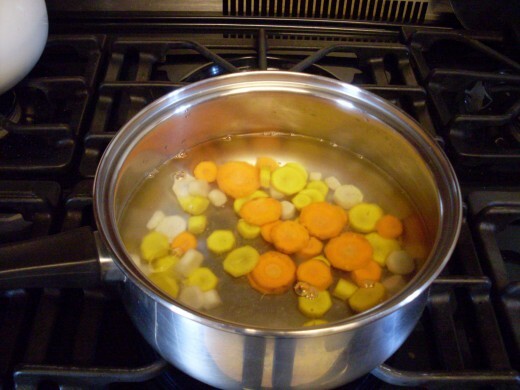 As soon as the water boils, put in some carrot slices, and watch to see when the pot returns to a boil. As soon as it has regained its boil, begin timing 3 minutes. As soon as the three minutes are up, scoop out the carrots with a slotted spoon, and place them in the sink of cold water. Repeat with all remaining carrots. 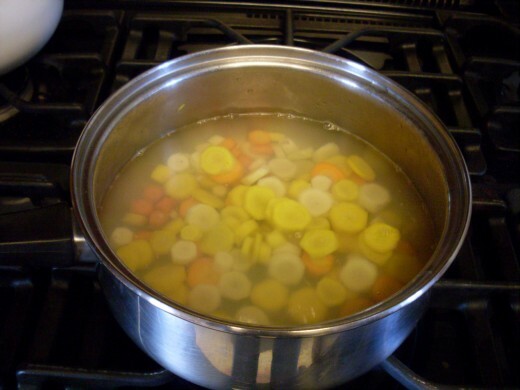 Blanching does three major things. One, it "sets" the color of the carrots, Two, it makes them easier to cook later, and Three, it preserves flavor. Now, the carrots are ready to bag. Label quart bags - carefully and legibly - with the exact contents, and the date. Put in as many carrots as you think you will need in an average meal, seal, and freeze! 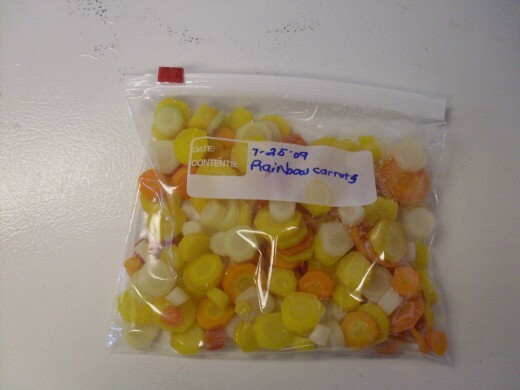 You can use rainbow carrots any way you would use regular carrots, but they are especially nice for chicken pot pies and other casseroles, and snacking raw. Another favorite of mine is a vegetable bake, with beets and potato wedges, onions and sometimes green beans. To use this way, generously coat the bottom of a baking pan with olive oil, and sprinkle in some salt and herbs, if you like. Quarter the beets, slice the carrots into sticks, slice the onions or cut them into wedges, cut the potatoes in wedges, and arrange all in groups within the pan. Cover all vegetables to coat with oil. Cover with foil, and bake in a moderate (350* F.) oven until all the vegetables are tender. Each color of carrot tastes a bit different. The whites are strong, a bit wild and almost spicy; the yellows are sweet and mellow; the reds are lively, but not overbearing; and the purples are earthy. The History, development and evolution of the carrot. Maggie, I've never actually tried freezing carrot greens, though I have dried them and used them similar to parsley. 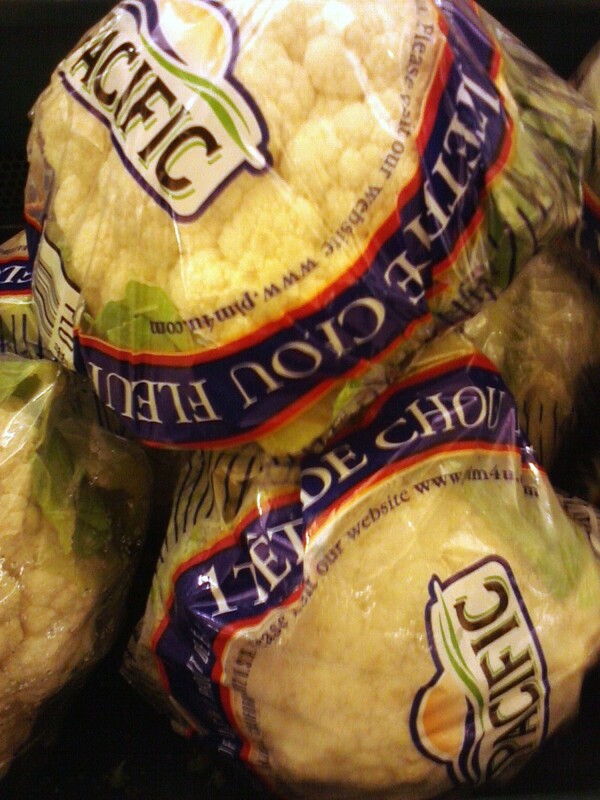 I imagine you can freeze them like any other green. When doing spinach, goosefoot lamb's quarters, arugula, etc., I've simply washed them and packed them in freezer baggies, in the amounts I'll use at one time. They do, of course, become limp after having been frozen, because the cell walls burst from water expansion, but the tastes are normally not altered. can you freeze the greens? how? 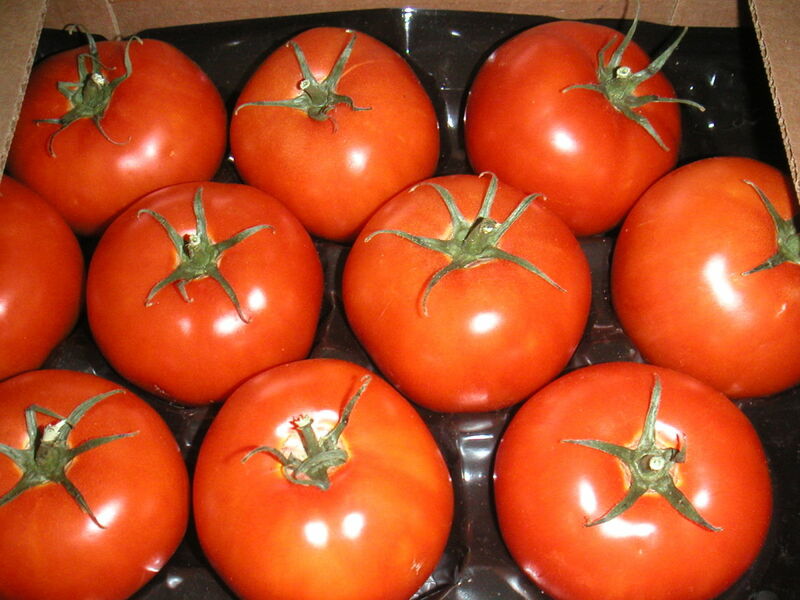 Fastfreta, I've never been to Southern California, and in fact am from a dry, almost completely rural area without much selection in produce in the local markets, so I don't have a clue what may be available. I hope you find many bright and interesting carrots to try. 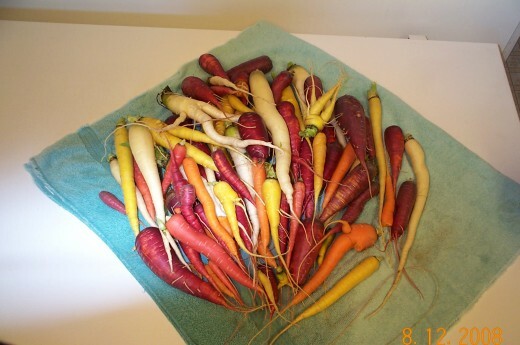 If not, rainbow carrots are so good, you might consider growing a few, if you can. Good luck! Thank you ButterflyWings for sharing this info. Who knew that carrots comes in so many colors. I live in So. Calif, and has never seen anything but orange carrots. I will look for them in my local markets now. You're welcome. Let me know what you think of them, and your family's favorite way to use them. Thanks for this information. I am growing rainbow carrots for the first time, this year.